Last edited by thedollar on Fri Nov 30, 2018 12:36 pm, edited 2 times in total. What kind of job are you hoping to get? Last edited by thedollar on Fri Nov 30, 2018 12:37 pm, edited 1 time in total. But if you have a swr <4% why on earth would you want to work full time? Sell the condo, learn how to invest and support yourself with your part time job until you do not need that income any longer. Well, strictly speaking, the value of the place where you live does not count towards your net worth before you have actually sold it. So as of now, you still have a long way to go. Looking for any job within economics.. Market analyst etc. In a sense I might be financial independent, yes. Only if I sell my condo though as the money is not invested in something that I can easily sell or get a dividend from right now. This is my struggle since my mind has adapted to having this home (great location, ok space). I'd possibly have to exchange it for something smaller at another location . It would also mean having my housing expenses probably 2x of what they are right now. So that is what I am contemplating right now. Why keep the apartment if it means I'll have to work another 30 years when I can just rent? Last edited by thedollar on Tue Mar 14, 2017 9:55 am, edited 1 time in total. I do agree with you to some degree. In FI context the apartment probably shouldn't be counted as net worth. For all other purposes I think it should. Either way you're in a GREAT spot! You're definitely gonna find an interesting job in finance! Have a good time at work, and know if it ever becomes overwhelming, you're financially set and can find something new anytime. This is what it's all about. We work because we want to, not because we have to! Therefore I declare you financially free! Well... If only it was that simple! In that order. Which would mean selling the condo. Like many of you on this site I have discovered that a job and/or excessive spending does not necessarily equal a good life or life meaning. I don't think a full time job is a permanent solution for me but it's something I'd like to do for a limited period of time. My goals are not static so I'll try to set my life up in a way that makes me FI and possibly the means to have a higher spending level in the future if my life is to change (kids.., etc.). That's one of the factors when choosing to continue working for some years. There's also the social stigma from family and friends regarding having a job.. but this has of course been discussed a lot on this site already. Since housing is my biggest problem I have tried to estimate what would happen if I was to rent an apartment. I live in an expensive city so the rent is much higher. Last edited by thedollar on Sat Oct 28, 2017 5:45 am, edited 1 time in total. At some point it dawned on that I have been calculating the post-ER tax too high. If I was to withdraw 4% from my stocks right now it would be nearly tax free. In the future I will be calculating with taxes only on the mandatory dividend (around 2% for most stocks). That would most likely be 4% x 0.5 (half is 2%) x 37% (the tax rate could be around 27-43%) = 0,74%. That's 0,74% / 4% (SWR) = 18.5%. And that would even be pretty conservative when using 37% since that's based on $43,000 dividend. This month I've sold a lot of things I just had laying around which helped increase my networth quite a bit. Pretty happy with this month. It wasn't too hard on me and I made some progress. My spending is the only thing I'm unhappy with. Guess I'll keep it lower the coming months. Last edited by thedollar on Sat Oct 28, 2017 5:42 am, edited 1 time in total. Sadly this handsome fellow ain't me. It's Simon Spies - almost all Danes will know him - a crazy but brilliant entrepreneur. "You'll start by saving 100 millions and then take it from there"
Last edited by thedollar on Sun Apr 02, 2017 7:25 am, edited 1 time in total. I did some intense investigative research (wikipedia) on Simon Spies. Besides his incredible accomplishments, he was apparently a morning person. Well, guess I'm ready for an April update. Almost no more expenses for this month besides a few dollars for the weekend. Seems that it has been a great month. In only 30 days my networth has increased by almost 3 months of expenses! To achieve this I have been selling some stuff laying around and my stocks have helped as well. I still have a few items I plan on selling in May. Also, my "big sale" has not gone through yet so I have not received the commission. It's quite nerve-racking when we've been working on this for over six months. Last edited by thedollar on Sat Oct 28, 2017 5:36 am, edited 1 time in total. Reporting: Cleaned up all numbers and changed to a new improved format. $ volatility has been causing bad returns and problems with the numbers. I now use a set $ rate for each month. Wrote off / phased out some physical cash, so the accounting is now more conservative. Net worth: 54.00x -> 54.03x (+ my expenses paid). Actual expenses SWR 2017: 1.97%. Net worth: 54.03x * 1.10 = 59.43. Allocation: hit 60% stocks, reduce stock picking. Non-financial goals: Get new job. Spend less time reading news / about finances / updating portfolio. I have 'cracked the code' on taxes - meaning I have learned a bit - this year. This will significantly reduce my tax burden for years to come. August 2017: 22.29x // Bought new furniture. Some kind of weird inconsistency currently bugging my numbers around June / July 2018. Over all the development seems right though and there should be no problems going forward. Last edited by thedollar on Fri Aug 31, 2018 9:56 am, edited 18 times in total. I find your reports quite interesting, so consider me a new subscriber. A couple of questions arose as I read through your journal. Low interest rates are a bummer in the EU right now, as you're basically losing purchasing power even with investment grade bonds, but what are we to do? I'd like to hear your thoughts on having cracked taxes. What did you learn? Congrats on hitting six figures! I assume that NW includes your home equity? Still, a great accomplishment. "Cracking the code" might be overstated hence I consider myself a novice regarding tax laws. What I really mean is that I have learned a lot this past year and I am still processing it. However, for 2017 I was able to reduce my tax considerably and might get a big tax return. I might not be able to do this looking forward but I now know how to optimize. Another area in which I am learning is investing. Can't believe it took me so long to gain an interest in this area. Regarding your question and observation that I am loosing purchasing power; I believe you are right! I like to think about my portfolio as having a low-risk part (cash, bonds, T-bills (?)) and a high-risk part (equities). In this environment the prices are extremely high fundamentally for equities and thus an investor must accept more risk - since prices could crash and yields are lower. On the other hand for the low-risk part of the portfolio I must accept extremely low or negative returns to eliminate risk. In total investors are faced with higher risk or lower returns. Pretty bad environment for investors... Right? Anyway, that's my take on things. I could switch my cash with bonds but the only way I know of to purchase bonds is through a fund with high costs (0,5%) and pretty low returns (about 2%). If we have an interest rate chock scenario where inflation and interest rate goes considerably up bonds are somewhat screwed as well so bonds also carries risks compared to cash. That's my reasoning at the moment but I am increasing my equities part slowly atm since it is pretty low. I agree completely with just about everything you just summed up. Going forward, high equity valuations and rock-bottom interest rates will probably give us lower than historical returns for a number of years. Of course, this is just guesswork and my crystal ball could be wrong. Cash earning 0.9% is more attractive than a credit risk free government bond of significantly longer duration earning less interest. For comparison, the 10 year danish treasury is currently yielding ~0.6%, but then you have significant interest rate risk. In that case, you're basically betting on the interest rates to drop further in the short run, which is the only case where you're going to win. If rates stay the same or go up, the cash holding is better. 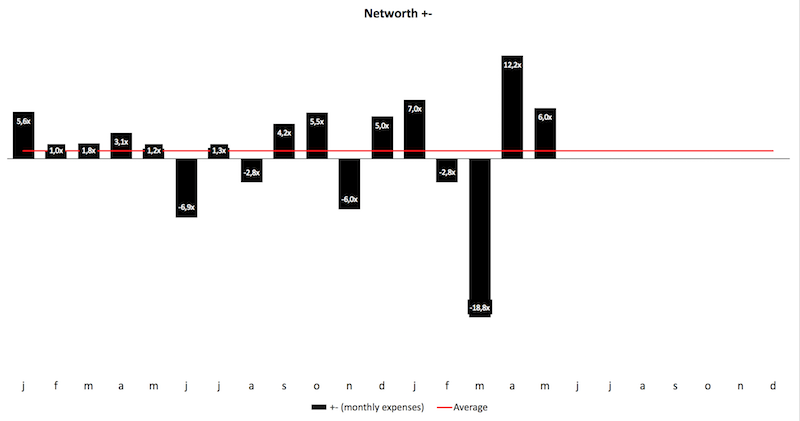 Here's the volatility in my networth measured in monthly expenses. Losing above 1.5 years expenses in a month? wwwhh, that's "awesome". Does anyone know how to upload crisp images?